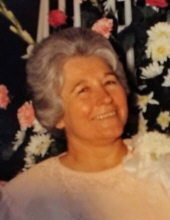 Mrs. Juanita Ussery Fordham, age 82 died April 12, 2019 at Southland Nursing Home and Rehab. Graveside services will be held Monday, April 15, 2019 at 11:00 A.M. at Dublin Memorial Gardens with Rev. Wayne McDaniel officiating. Mrs. Fordham was born January 6, 1937 in Montrose, Georgia, was a retired customer service representative with Mohawk Carpet Company, and a member of Pinehurst Drive Baptist Church. Mrs. Fordham was preceded in death by her parents Hardy Ussery and Annie Watkins Ussery, by granddaughter Amber Fordham, by brothers Wendell Ussery, Jerry Ussery and Jack Ussery, and sister Nell Patterson. Mrs. Fordham is survived by her husband Donald Fordham of Dublin, by sons Rusty (Wendy) Fordham and Ricky (Fran) Fordham of Dublin, by a brother Ray Ussery of Haddock, Georgia, by a sister Lois Patat of New York, and by three grandchildren, Trey (Lindsay) Fordham, Rachel (Tyler) Gay, and Tiffany Fordham. The family will receive friends Sunday, April 14, 2019 from 5:00 P.M. until 7:00 P.M. at Stanley Funeral Home and Crematory in Dublin. To send flowers or a remembrance gift to the family of Juanita Ussery Fordham, please visit our Tribute Store. "Email Address" would like to share the life celebration of Juanita Ussery Fordham. Click on the "link" to go to share a favorite memory or leave a condolence message for the family.